Now that the weather is warm and sunny, many people want to participate in activities that will let them be outdoors and enjoy nature. However, for many elderly adults with health or mobility issues, it can be hard to get them out of the house and engaged in activities. If your aging parent is not so independent anymore and is dependent on an elderly care provider, they may feel like it’s just not worth it to get up and active. One way to change their mind is to set up a senior-friendly garden space for them to enjoy and even tend. 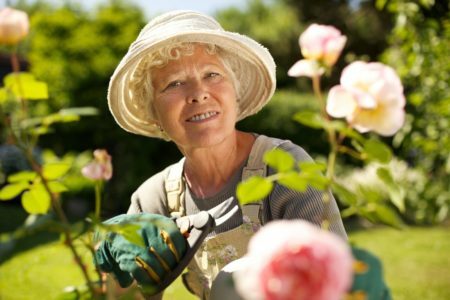 What is a senior-friendly garden space? It’s an area that an elderly person with mobility issues can go to enjoy the outdoors and be surrounded by beauty. Many seniors even get involved with growing fruits and vegetables in their garden space. Studies show that spending time in nature and gardening can both reduce stress and the exposure to sunlight generates vitamin D in the body. Tending to a garden provides exercise for elderly adults as well. All in all, there aren’t many other hobbies that can accommodate elderly adults with mobility and physical health problems. So how do you create a senior-friendly garden space? -The first step is to evaluate your elderly mom or dad’s living space. Look for a sunny spot in the yard that is on flat ground and is close to the house. You might consider a patio or porch area as well. Even one end of a driveway or side yard can be an excellent senior garden space. Senior gardens don’t have to be large plots in spacious yards. Even the smallest balconies can be transformed into beautiful gardens. -Once you’ve decided where to put the garden, make sure your elderly parent can get there easily. If they are confined to a wheelchair, they may need help from their elderly care provider. However, the garden should be in a place that they can get to with little effort. Next, you’ll need to find containers or build raised beds for the plants. Seniors struggle with bending and stooping in a traditional garden, but container gardening and raised beds bring the plants to their level. As long as there is good drainage, just about any container can be used for growing vegetables and flowers. -Consider what kind of garden your aging mom or dad would like. Many seniors enjoy flowers and plants that attract bees, birds, and butterflies. You can set up a birdfeeder in the garden as well for them to enjoy. Choose easy-growing plants so your mom or dad gets maximum enjoyment. If you are growing fruits or vegetables too, then find hearty varieties that produce lots of good things for your aging parent to enjoy. Creating a senior-friendly garden isn’t hard to do, and your aging parent will love the opportunity to get outside and enjoy the fresh air. With help from you, other family members, elderly care providers and neighbors, creating and maintaining a senior-friendly garden won’t be hard but will definitely be worth it for the benefits it brings to your loved one.